Descubra las ricas tradiciones vinícolas de St-Emilion en una visita de degustación guiada desde Burdeos. Con un grupo de compañeros entusiastas del vino, pase aproximadamente 9 horas visitando dos viñedos distinguidos en este territorio catalogado por la UNESCO para degustar y aprender sobre exquisitos varietales locales. Su excursión incluye fascinantes recorridos por la propiedad, sesiones informativas de degustación, un almuerzo buffet y tiempo independiente para explorar la encantadora ciudad de St-Emilion y sus monumentos subterráneos como la iglesia y la ermita. Aprende sobre la producción de vino visitando dos fincas vinícolas del castillo. Incluye transporte de ida y vuelta en autobús desde Burdeos. A thoroughly enjoyable day visiting 2 vineyards and the charming town of St Emilion with informative explanations of wine making in the 2 Chateaux, tastings of the wine produced, a lovely lunch and an interesting visit to the sites in St Emilion - the highlight of our holiday to Bordeaux. The guide at the second Chateaux made the day for us with his generous spirit and hospitality. Tres bien! Highly recommended. Great tour and lunch. Excellent lunch at the gite which also produces wine. Went to two vineyards and drove through lovely wine country. The guide was somewhat informative, but mainly the information came from the folks running the vineyards. Once we were in St. Emilion the guide was quite knowledgeable about the subterranean monuments relative to the Christian worshippers and St..Emilion. A little pricey, but considering the lovely lunch with very good wines, probably worth it as you could not really drive to these places easily on your own. We had a marvelous day touring two wineries with a fantastic lunch and generous amounts of wine! We met some lovely people and loved the town of St. Emelion. It was so relaxing not worrying about having to drive or decide which winery to visit. The tour guides were great. I highly recommend this trip! Great day out visiting 2 Chateas, lunch was really well done and very delicious with lots of value and lovely wine tastings. This was a great tour. We started promptly at the time stated! Our tour guide, Laurence Pontallier was great! Very informative, funny and kind. She also kept us on our toes so we would not fall behind with the time. The winery's we visited were very informative. The second winery where we had a male guide was very funny and kept our attention! The food here was also great! Although this was a wine tour I found the old village of St Emillion the most interesting! We went down to the underground church and climbed the bell tower!! Went shopping in this town too! Very informative and pleasant. The St Emilion Chateaus are not as grand as the Medoc ones, but they are charming nonetheless. A beautiful location and delicious lunch. Well done. The tour was excellent. There was lots of information from each vineyard without too much redundancy. The lunch was great with lots of wine! The tour through the underground church in St Emilion was impressive, and the free time in town to explore was nice. The components of the trip were excellent but it was in the wrong order. 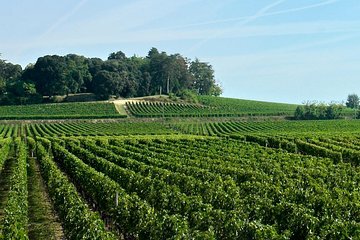 We recommend that first there is a tour of St Emilion, then lunch, a tour of the chateau where we had lunch and the chateau with caves needs to be last. Lunch was nice but for a non pork eater such as myself there was less choice.